The Indonesia Warriors won their third game in a row, even as the San Miguel Beermen exacted vengeance and the Chang Thailand Slammers moved up from the cellar in the past week of ABL basketball. Imports Chris Daniels and Steve Thomas didn’t dominate for the Warriors, but it was okay as Pinoy imports Jerick Cañada and John Smith caught fire, scoring 12 and 14 points respectively, to lead the Indons’ conquest of the Slingers. Daniels and Thomas collared 11 rebounds each as the Warriors moved up to a tie for second place with 3 wins against 2 defeats. 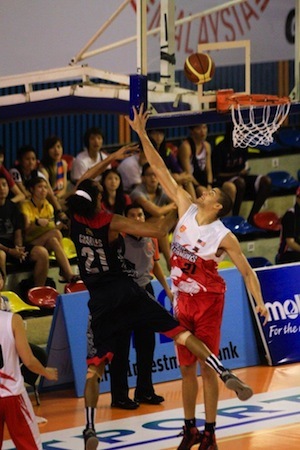 Kyle Jeffers and Wei Long Wong led Singapore with 27 and 10 markers respectively. The San Miguel Beermen also won big this past weekend, avenging an earlier defeat in Vietnam by subduing the Heat in Manila, 100-74. Gabe Freeman and Brian Williams combined for 39 points in the Beermen’s convincing win, while four Pinoys registered double-figure scoring. Chris Banchero and Asi Taulava each tossed in 14 points, while former FEU Tamaraws Leo Avenido and RJ Rizada pumped in 10 markers each. The San Miguel crew rose to solo first place with the win. Imports Dior Lowhorn and David Palmer led Saigon with a combined 47 points. In the last game of the weekend, the Slammers won their second game of the season after turning back the Dragons, 77-65. Chris Charles had a monster game, scoring 29 points, grabbing 27 rebounds, getting 2 steals, and blocking 4 shots. 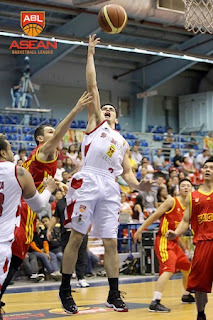 For his part, Forilan Baguion also did really well, hitting four treys on his way to 23 points. The pint-sized Pinoy guard also raked in 8 rebounds, 7 assists, and 2 steals for the Thais. The Dragons were paced by Gavin Edwards’s 13 points and Patrick Cabahug’s 14 markers. 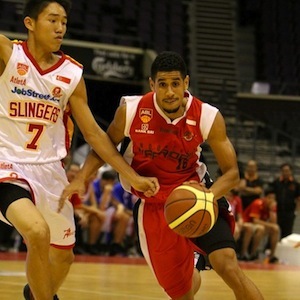 Despite a valiant effort by Kyle Jeffers who finished with 27 points, the JobStreet.com Singapore Slingers went down to the Indonesia Warriors 57 to 69 tonight at the Singapore Indoor Stadium. The Warriors’ John Smith had a fantastic game as he finished as his team’s highest scorer with 14 points. It was truly a team effort by the Warriors however as nine out of the ten players who hit the court made it on the statsheet. The first quarter started off evenly with both teams exchanging baskets until a Steve Thomas jumper at the halfway point followed by a Mario Wuysang three gave the Warriors their first significant lead of the game at 11-5. The Slingers managed a lot of attempts but were just 12% from the field in this period. The Warriors capitalized on that and earned themselves a ten point lead with a minute left till the second half and held on to it to finish the period leading 17 to 7. The opening minutes of the second quarter saw Kyle Jeffers open up the scoring to cut the Slingers’ deficit to 8 points but the Warriors’ Amin Prihantono answered immediately with a three. The Slingers were determined to get themselves back in the game but the Warriors were on fire. Despite 12 turnovers in the first half, a very well rounded team effort earned the Warriors the 11 point lead at 36 to 25 going into the halftime break. The third period saw the Warriors build up their lead to 17 led by John Smith’s hot hand. Smith calmly converted two free throws to give the Warriors their biggest lead of the game with 3 minutes to go until the fourth period. Undeterred, the Slingers kept pushing back and a Jeffers three put them back within 9 points. 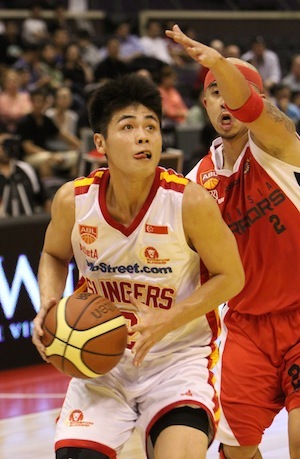 With the seconds quickly ticking down, Wu Qingde beat the clock to bring the Slingers within 7 points as they head into the fourth quarter 43-52. The Warriors started the final period on a 9 point run to regain a double digit lead at 61 to 45. Despite committing 23 turnovers in this game, the Warriors were also 50% from the field. In the end, the Warriors grabbed their third consecutive win 67 to 59. 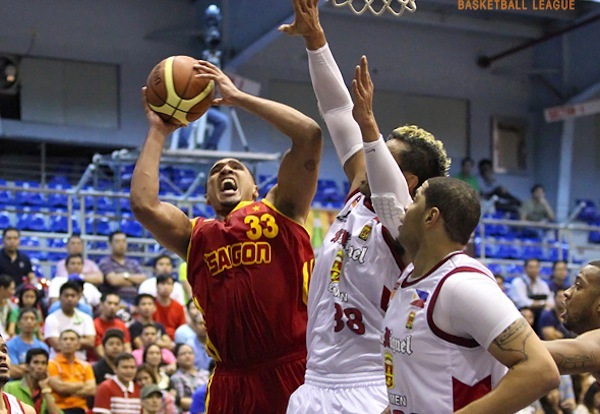 The San Miguel Beermen made a statement today in their home opener against the Saigon Heat. After going down to the Heat at Tan Binh Stadium last Saturday, the Beermen played a near pefect game to dominate the Heat 100-74 at Ynares Sports Arena, Philippines. The Beermen are also the first team to reach 100 points in the ABL this season. Gabe Freeman found his shooting touch and led the Beermen with 21 points, followed by Brian Williams with 18 points. Chris Banchero and Asi Taulava added 14 points each for the Beermen who finished the game with an impressive 59% shooting from the field. The Beermen outscored the Heat 44-18 for points in the paint. With David Palmer sitting on the bench early in the second quarter due to foul trouble, the Beermen took advantage and made a run. The Beermen closed the second quarter with an 8-1 run which gave them a 55-35 lead at halftime. Eric Menk made a lay-up off a nice assist from Banchero, then Asi made back to back baskets and Banchero converted two free throws to cap off the run. Things did not get better for the Heat in the third quarter as Palmer picked up a technical foul which was his fourth in the game with 8:21 left. The Beermen stretched their lead 78-47 with 1:37 left in the quarter from a Banchero basket and two free throws from Leo Avenido. 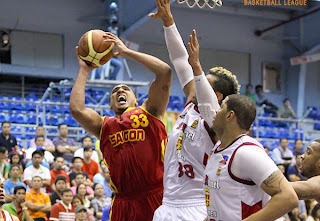 Although they had a big lead in the final quarter, the Beermen’s intensity on defense did not go down one bit. They were still going hard for all the loose balls and played aggressive defense on the Heat. This is proved from a couple of hustle plays from Banchero which increased the Beermen’s lead even further. A pair of free throws from Axel Doruelo with 2:08 left in the game then gave the Beermen their biggest lead of the game 100-65. Dior Lowhorn was the leading scorer for this game as he finished with 29 points. Lowhorn deserved high-praise, never letting up his game until the buzzer sounded. Fighting with foul trouble the whole game, Palmer was limited to only 26 minutes but managed to finish with 18 points and 12 rebounds. After a stellar perfomance during the first meeting, Jai Reyes was not able to replicate his perfomance. He was scoreless until the final period and finished with 4 points. Larry Tieu had another solid performance for the Heat as he finished with 9 points. avenged their previous loss to the Heat. SMB's Asi Taulava and Brian Williams. Froilan Baguion and Chris Charles were not to be denied in this afternoon’s rematch between the Chang Thailand Slammers and the Westports Malaysia Dragons. After making just one field goal in the first quarter, Baguion and Charles took over the rest of the game to help the Slammers win their second straight game as they defeated the Dragons 77-65. Charles had a career game and finished with 29 points and 27 rebounds, followed by Baguion with 23 points for the Slammers who outrebounded the Dragons 54-35. The Dragons started the game very well and quickly earned themselves an early double-digit lead 16-6, on a three-point shot from Cedric Bozeman and a lay-up from Moala Tautuaa with 3:06 left in the first. Their stingy defense only allowed the Slammers one field goal in the first ten minutes which saw the Dragons lead 18-8 after one quarter. Things started to turn around in the second quarter. 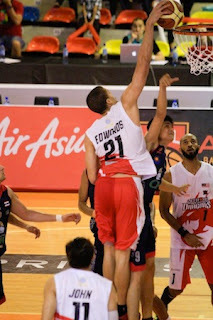 A hook shot from Charles in the paint and a lay-up from Wuttipong Dasom sparked a 14-2 run for the Slammers which was capped off by a three-pointer from Dasom to gave the Slammers a 22-20 lead. Then Baguion hit a three-pointer and set Charles up for a dunk which stretched the Slammers lead to 29-22 with 4:03 left before halftime. Patrick Cabahug and Cedric Bozeman tried to stage a Dragons comeback in the third quarter. A steal from Cabahug was finished by Bozeman with a monster jam and a four point play from Cabahug helped the Dragons cut their deficit to 38-37 with 6:40 left. But Charles responded with a back to back baskets to deny the Dragons the lead. Baguion, a veteran point guard, proved he is not afraid to take big shots in crucial time as he nailed a three-point shot with 5:13 left in the game which gave the Slammers a 66-55 lead. Later in the game, Bozeman’s lay-up got the Dragons to within 7 with 2:12 left. A chance to get closer was shut down by Charles after he grabbed an offensive rebound and scored, which stretched the Slammers lead to 75-65 with 1:18 left. Slammers head coach Joe Bryant credited his team for playing smart basketball. "We got more physical and played great defense. The team played very smart and this is a great win for us," Bryant said after the game. Cabahug led the Dragons with 14 points, Gavin Edwards had 13 and Bozeman added 11 points plus 11 rebounds for the Dragons who suffered their third straight loss.